Is your rabbit sneezing due to Pasteurella bacteria? Learn how to tell whether Pasteurella species of bacteria are at the root of your rabbit’s sneezes and use the following guidelines to differentiate between various other causes of rabbit sneezing. Rabbits never sneeze without a reason. When they do, there’s always an underlying cause. Some reasons are harmless, but there’s one cause of sneezing that is very bad – Pasteurella bacteria. Click here to learn more about Pasteurella multocida, the bacterium that causes Snuffles and a host of other hard-to-cure infections in a rabbit. Click here for a breeding plan that over time will eradicate Pasteurellosis symptoms from your rabbitry. Read on for help making a rough determination of whether or not the pasteurella bacteria is the culprit when your own rabbits are sneezing. 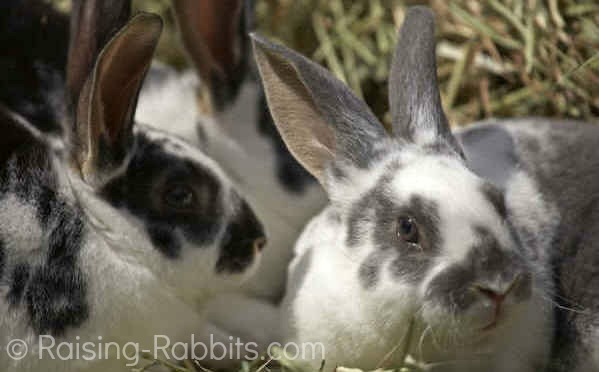 If I were a new rabbit owner checking into Raising-Rabbits for the first time and reading the information on Snuffles, I might be tempted to really freak out. That’s because chronic rabbit sneezing can possibly be the absolute worst thing that could happen to your rabbit. There’s a reason why our information on Snuffles and the Pasteurella bacteria seems so apocalyptic – a diagnosis of Pasteurellosis is likely the beginning of the end if that diagnosis is accurate. Pasteurella is very difficult to cure. Mechanical causes due to factors OTHER than mucus – dust, water, pellet fines, etc. An assortment of other germs and bacteria able to cause suspicious symptoms in your rabbit even if it is not frequently sneezing. Before doing anything drastic, first consider all the various possible causes of sneezing and/or other symptoms associated with Pasteurella bacteria. We've listed them below. Determine which of these potential causes might be causing your rabbit's symptoms and eliminate from consideration those causes that don't apply. Once you’ve drilled down as best you can to one or two possible culprits, you may require some laboratory testing to make a final determination and then to plan a course of treatment. Or, if you are following a breeding and culling plan intended to result in a high level of health throughout your herd, you may decide that you don’t need to know the exact bacterial source of the symptoms. If you’ve eliminated the innocuous mechanical causes as reason for your rabbit’s symptoms, perhaps you will now decide that the sneezing is evidence the rabbit’s immune system is unable to keep the rabbit fully healthy. In this case, eliminating the rabbit from your breeding program becomes a valid option. 1) Are there any mechanical reasons for your rabbit's sneezing? Is the pelleted feed dusty? Are there lots of fines in the food dish or feeder? Did you just sweep out the barn? Is it windy outside? Is the air around your rabbits particularly dusty right now? Is it springtime and is the air loaded with pollen? Did you just fill up the water crock? Did the hose splash water into the rabbit’s face accidentally? Did the rabbit bury its nose in the water not seeing it was so full? All of these can cause sneezing, but the sneezing will be occasional, dry-sounding (if the water crock was not involved) and temporary. In this case the news is good - your rabbit is actually just fine. 2) If your bunny is young and you've eliminated #1 above as a cause for sneezing, then Bordetellosis would be a likely suspect rather than Pasteurella bacteria. Bordetellosis is caused by Bordetella bronchiseptica, which carries a much better prognosis than do species of Pasteurella. Is your rabbit 4 months old or younger? Bordetella is more likely to affect young rabbits. It also causes symptoms that are very similar to those of Pasteurella bacteria - frequent sneezing AND clear or white mucus. If your young rabbit seems to be healthy overall, perhaps the mild symptoms will clear up as its immune system conquers the problem. On the other hand, a round of antibiotics tends to be very effective against bordetella; check with your vet. 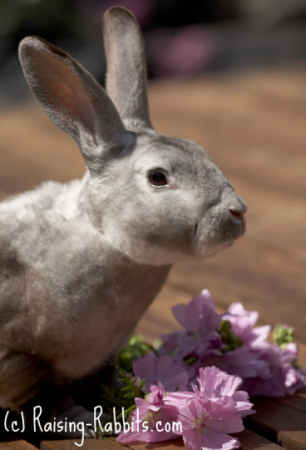 Some researchers feel a rabbit, once cured, remains a carrier of Bordetella germs. Others feel the chance of a complete eradication of Bordetella is good. Bordetella bacteria tend to open the doors to the bad guy bacteria. That's why it is very smart to nip Bordetellosis in the bud. 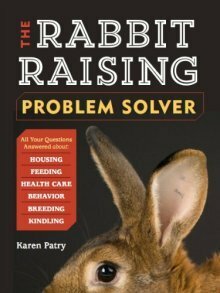 If your rabbit gets better and stays better, you can be optimistic for your rabbit's long-term survival. 3) Pasteurellosis due to Pasteurella multocida. This is a worst-case scenario. Although there are a few other pathogens that could be affecting your rabbit (see #4 below), the most common and the most deadly upper respiratory infection is due to Pasteurella multocida. In this case, the long-term prognosis is not good at all. If you have more than one rabbit, you will need to consider the high contagion of Pasteurella and practice excellent quarantine as you care for all your rabbits as long as your sick rabbit lives. I am a strong proponent for euthanasia for any case of pasteurella. Meaning confirmed Pasteurellosis, mind you, not just killing willy nilly because of a sneeze or two. This is in order to raise the immune strength and health of all surviving rabbits everywhere, with the end result that you would (almost) never again need to fear falling in love with a rabbit only to find it is sick with Snuffles. It is also logical that pet- and livestock rabbit owners who already love their bunnies will be loathe to simply euthanize them. Not everyone will be able to accept such a final course of action in their personal cases. And that's fine. In the meantime, please take care not to contaminate the environment of other healthy rabbits. 4) Other bacteria that cause symptoms commonly associated with Pasteurella bacterial infection. Conjunctivitis frequently accompanies Pasteurellosis. Interestingly, at least one study revealed a fairly long list of germs that have been cultured from rabbits with conjunctivitis, though it was not clear whether or not these rabbits were also sneezing or concurrently sick with Pasteurellosis. We all fear Pasteurellosis. But if your rabbit is young, is only sneezing occasionally, has a bit of conjunctivitis, or has just received a scoop of dusty pellets in its feeder, it could be that the prognosis is not doom and gloom. The problem may be nothing, or you might be able to cure your rabbit with appropriate ophthalmic or antibiotic treatments. Always see your rabbit-savvy vet if necessary. Nevertheless, and sadly, the majority of rabbits that come down with chronic sneezing and a moist nose never manage to shake the infection, despite treatment. We provided this page to help you determine whether or not your rabbit is sneezing for some reason other than Pasteurella bacteria. Here's hoping that in your rabbit's case, the news is good. See also the Merck Veterinary Manual on Pasteurellosis if you are medically interested.